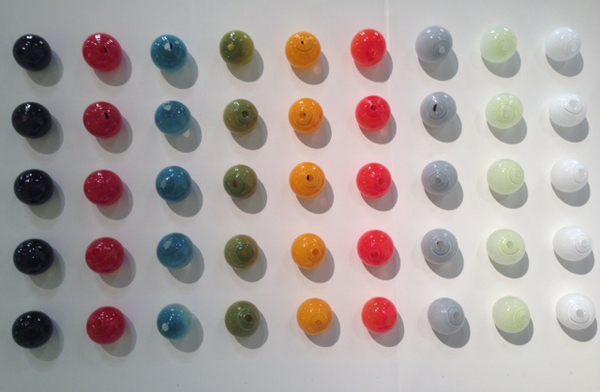 SkLO’s wall of decorative glass reflects the opaque color showing up in today’s hottest designs. We are winter weary no more. This week, we made a visit to the New York International Gift Fair at the Jacob K. Javits Convention Center and had my spirits lifted with the bright colors and fresh ideas from designers unafraid to create innovative products that are also easy and/or compelling for the eye. Here are a few of our favorites. Glass vendors, such as California-based company SkLO, which works with glassblowers in the Czech Republic to create remarkable glass products including lighting and jewelry, are adding more and more opaque pieces to their collections. 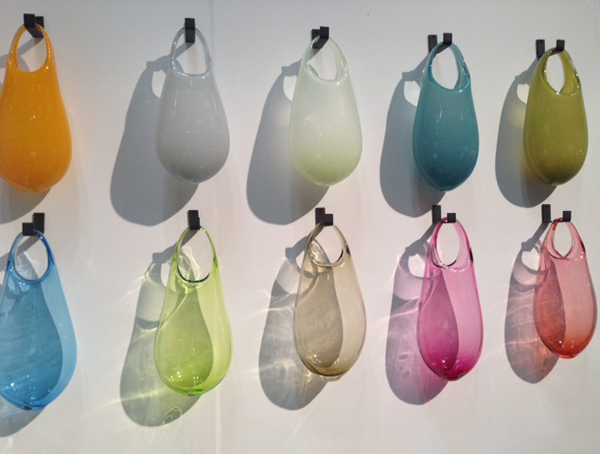 Refreshingly simple, these muted opaque hanging flower vases (top row) join SkLO’s transparent versions (bottom row) that are wall art with or without a bouquet. 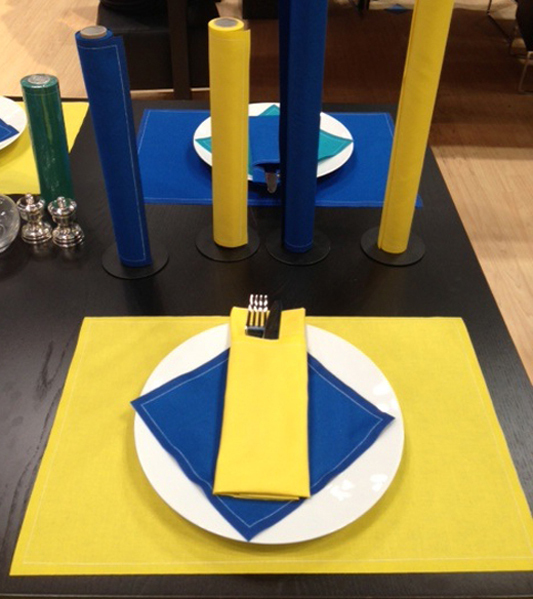 MYdrap, the Barcelona, Spain, company that creates biodegradable napkins and placemats perforated on a roll (what a great idea), introduced Lemon Yellow, Marine Blue, and Emerald Green as its show-stopping colors for spring. The vintage styles are perfect for efficient, eco-friendly, and stylish dining. Pom-poms continue to make their mark in home design, and various styles of the embellishment are to be found on everything from blankets to pillows to curtains to tote bags. 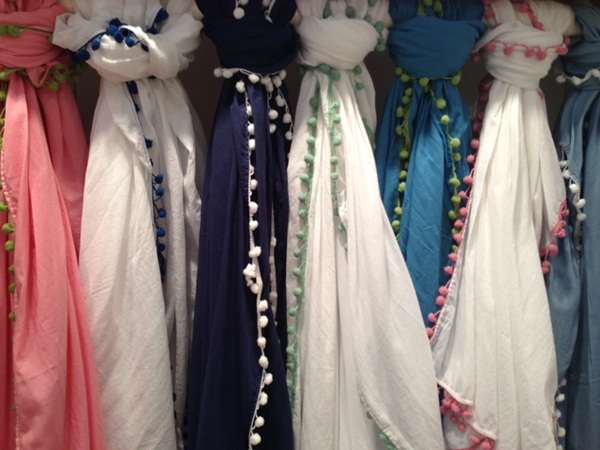 Designing home accessories from its Kentucky studio, Pomergrante Inc. presented these adorable tablecloths with mini pom-pom trim. Aalamwaar Textiles is based in Illinois, but its designer Viji Reddy looks to her Indian heritage to create the company’s many impressive prints. The newest addition is a line that utilizes natural indigo dye and involves a process that includes running water and lengthy steaming for the print to properly set. 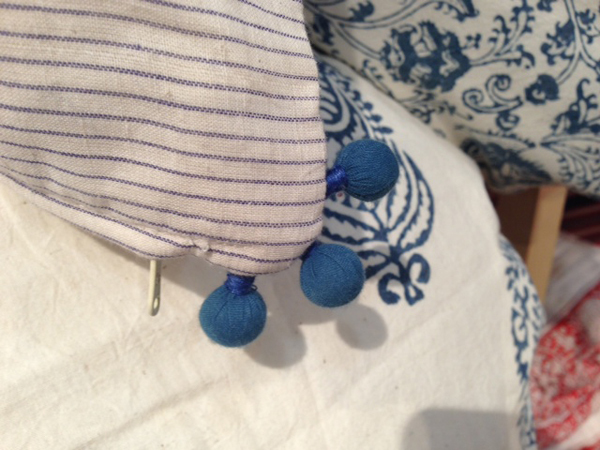 The three balls that decorate the corner of the pillows are hand-rolled poms. With her family, Alicia Adams of Alicia Adams Alpaca manages a herd of more than 200 alpacas at her home and farm in New York’s Hudson Valley. The alpacas are harmlessly shorn each year so that artisans in the United States and Peru can use the fleece to create the company’s clothing and home wares. 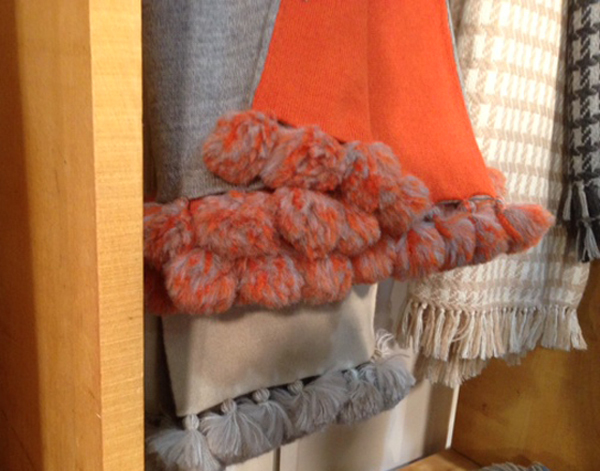 Large joyous pom-poms adorn the edge of this luxurious reversible throw, which is 100 percent baby alpaca fiber. 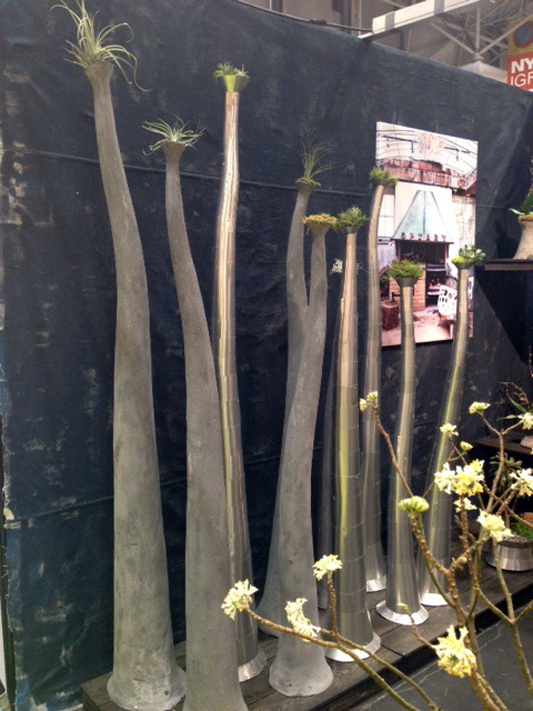 Opiary is an amazing garden design and manufacturing studio in Princeton, New Jersey, that creates these upward-reaching stacks that are intriguing, beguiling, and can be amusingly topped with succulents and moss. Playfully combining the look of Earth’s landscapes with that of other planets, the forms are either aluminum sheets faceted together or concrete layered on top of a metallic free shape. Young designers grabbed the spotlight with their fresh ideas and bold energy. 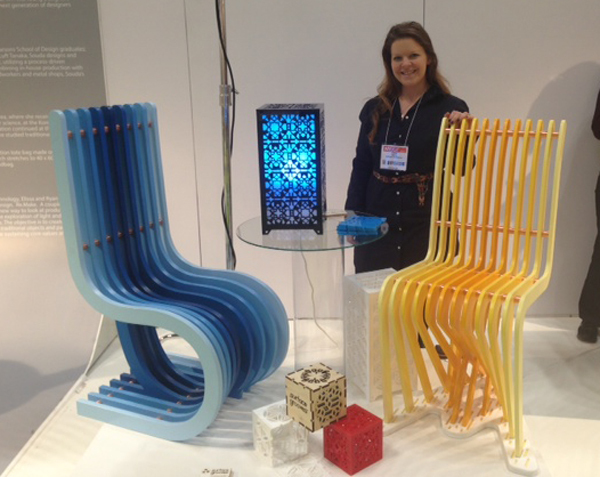 Here, Elissa Masin of New York’s Surface Grooves stands with her Light Box and two versions of her Profile Chair. Three graduates of Parsons The New School for Design joined forces last summer to form Souda. 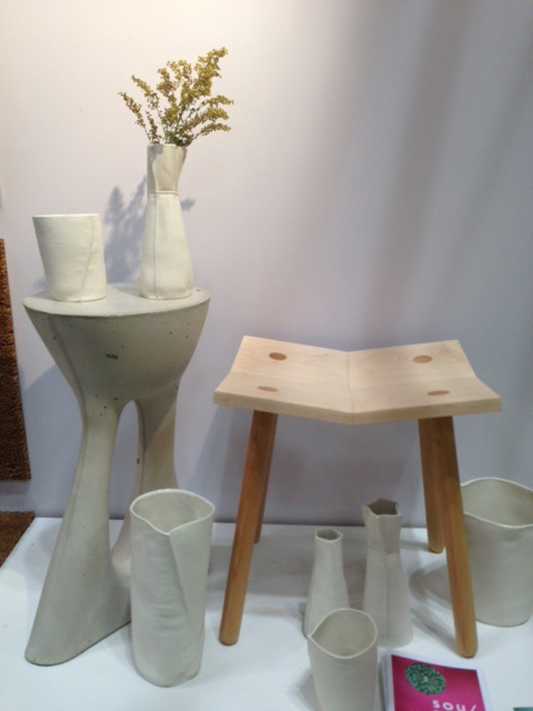 Its first collection includes the Mitre Stool (right), made of maple and also available in a charcoal color, the Kreten side table (left), made of fiberglass-reinforced concrete also in charcoal and sand colors, porcelain organic-shaped vessels, and a bubble chandelier made from post-consumer bottles sourced through Sure We Can, the only non-profit homeless friendly can redemption center in New York City. An insider's look at must-have products, fresh trends, and inspired spaces from the team at Design New England magazine. Gail Ravgiala is editor of Design New England and a fan of both the region's historic architecture and its growing inventory of modern houses and public buildings. Courtney Kasianowicz is associate editor of Design New England who scouts the area for new design, charming products, and local artisans both innovative and daring. Jill Connors, Design New England's editor-at-large, is an antiques maven and design scout and will post about trends and discoveries in the field. Bruce Irving, Design New England's contributing editor for architecture & building, is a renovation specialist who will share his insights on design and construction. Estelle Bond Guralnick, Design New England's style & interiors editor, will post about interior design and interior designers and her favorite finds. Royal Barry Wills designed this home located on a cul-de-sac in Brockton's West Side.